First off, This book is ONLY 300 PAGES. I don't know why this came as a shock to me, I was so sad because I want more... The 5th Wave was 457 pages so there's quite a difference between them. There's not much I can say about this book without spoiling Y'all, so this review will be very brief and small. So if you read my 5th Wave review, you would know that I LOVE that book. I gave The 5th Wave a 5/5 stars. 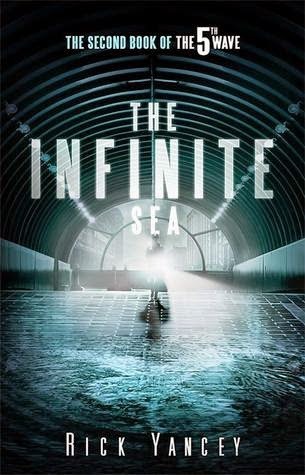 For the Infinite sea, I couldn't get into it as much, It took me a good week and a half to read this book - unlike the 5th Wave which I read in 3 days. In my opinion; the action only starts after the 1st half of the book. I found the start quite boring and dull, not much happened. I gave this book a 4/5 stars. Sorry for the really short review but I definitely recommend this series to any Young Adult fans!! I am sorry that you did not enjoy the book as much as you enjoyed the first one. I personally liked them both very much but I agree with you, with the beggining being a little bit dull. Well i'm glad that you enjoyed the Infinite sea very much, I wish I could of liked it more! Thanks for ya comment.